It is disappointing when entering a museum exhibition to encounter an oppressively-worded sign warning you not to take pictures inside. Thanks to the fine folks at the ThinkGeek webstore, this problem is solved! 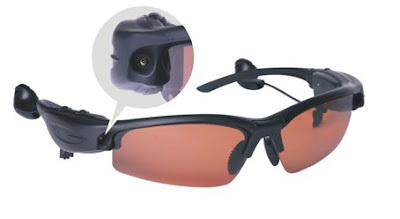 Spy Camera Sunglasses contain a 1.3 Magapixel still camera that can be activated via a remote key-fob type device. Images can be conveniently downloaded to your computer. So the next time you are ready to post an exhibit review for ExhibitFiles, make sure to pack your Spy Camera Sunglasses!